*denotes hard copy available for loan for SJU faculty at FJI. Annually the Office of the Provost requests nominations for the Saint Joseph’s University Faculty Justice Award. SJU's Faculty Justice Award recognizes a faculty member who demonstrates extraordinary leadership and sustained commitment to issues of faith and justice through their teaching, research and service. Fr. 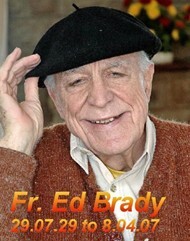 Edward J. Brady S.J. Faith in Action Service Award: The Fr. Edward J. Brady, SJ Faith in Action service award acknowledges a Saint Joseph’s University faculty member whose time and effort have constituted a “significant contribution” to fulfilling the Faith-Justice Institute’s mission to “promote social analysis and critical thought around faith and justice issues” and embodies the Ignatian ideals.